Where to find us - We're the most easterly of the Cayman Islands, located in the western Caribbean, south of Cuba and northwest of Jamaica, 450 miles south of Miami. 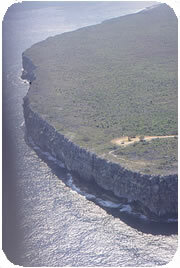 Don't blink - The dimensions of Cayman Brac are 12 miles long by 2 miles wide (at its widest point), 14 square miles of natural wonder. When to come - Our typically tropical climate means just about anytime is fine. Mean monthly temperatures range from 77°F (Feb) to 83°F (July); annual rainfall: 28 inches; wet season: May - Nov, dry season: Dec - April. Our welcome committee - Apart from our superabundance of bird, marine and reptile life, the 1,600 very friendly "Brackers" make "The Brac" probably the most welcoming and safest destination in the Caribbean. Our past and politics - The islands were discovered in 1503 (with Cayman Brac and Little Cayman sited first) and were settled by British descended families in 1833. We were a dependency of Jamaica from 1863-1957 and a British Crown Colony until 1972. We are a UK Overseas Territory and are administered by a Governor, Cabinet and elective Legislative Assembly. What's in our name? - Cayman from the Carib word for crocodile, Brac from the Gaelic (Highland Scottish) for bluff, describing the islands prominent 140-foot-high ridge. Meet the family - Specifically, our little sister - that's Little Cayman, approximately five miles to our left and well worth a visit. Visit our dedicated page for more information on this Nature Lover's Paradise. Nature tourism - Visit the heritage sites shown on the Hot Spots map, including historic houses, the Heritage House and the new 600ft Bight Road boardwalk into tropical forest. Enjoy the series of trails, caves and wetlands at your own leisure, or book a FREE guided tour with our trained Nature Tourism Guide by contacting us at Nature Cayman. Photographs are copywrited to Patricia Bradley, Yves-Jacques Rey-Millet, Bruce Hallet, Karen and Ian Stewart, Skip Harper, Max Hillier, Chevala Burke, and Delroy Bodden.